How to care for vehicular upholstery. The image above is Volkswagen’s ultra premium cloth fabric as fitted to every luxuriously kitted out base model T4 Transporter from the mid to late 90s until their retirement to pasture in the mid noughties. The fabric is known (quite creatively) as Aztec...I would call it ‘grey with pastel geometric highlights’. It is still available especially now that Volkswagen itself considers the T4 to be a ‘Classic’. My example dates from 2001 but it remains in near pristine (aka Barnfind/BaT) condition because, since 2002, it has been hidden behind seat covers. 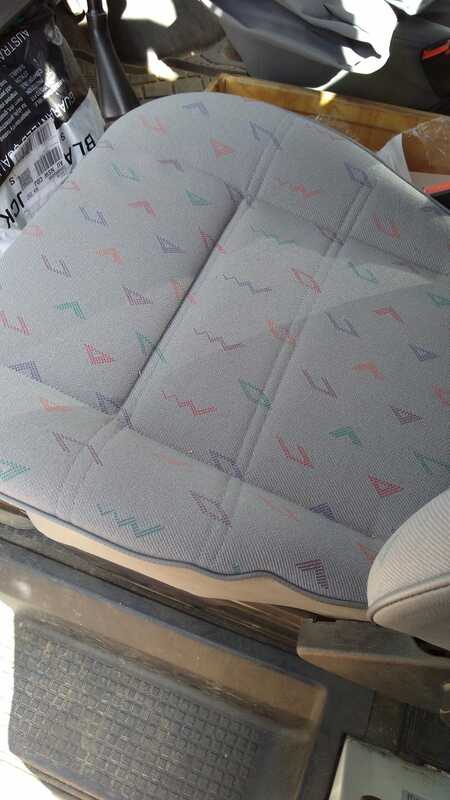 But not just any old seat covers...oh no, remember that this is a classic, prestige European automobile that is just as well kitted out as any 90s 3 Series (base model). This particular T4 had custom made seat covers. And they were made from Australian made Bradmill canvas... special grey canvas no less. Since then, they’ve done a couple of laps of the country, two dogs, one small boy, a few tumbles in the washing machine and quite a lot of my arse. After nearly 17 years...the canvas on the front seat bases had worn thin. Retirement beckoned. Black Duck canvas seat covers are made in Western Australia by Qualtarp and are pretty much the gold standard of seat covers in this country. The fact that they still have the capacity and inclination to make them for the Transporter (especially in the dual cab configuration) is both remarkable and heartening since it means the recognise the ‘significance, stature and status’ of this particular vehicle in the general scheme of things.